The Highest Quality MCT On The Market. Period. Feel The Difference With Every Scoop! MCT’s or medium-chain triglycerides are a form of saturated fatty acids that are abundantly found in coconut oil and have a long list of benefits ranging from fat loss, heart health, to neurological performance. C8 MCT, or Caprylic Acid is what we believe to be the most useful MCT you can consume because it is quickly absorbed and converted into energy within 30 minutes. So quickly that it can not be stored as fat. You will think more clearly, burn body fat, and experience lasting energy. Why? Because our brain cells are able to metabolize MCT's easily in order to produce energy. This leads to improved brain performance, and feeling sharper and more alert. Most people love taking Complete MCT’s with their coffee in the mornings before work because of the hours of increased in mental focus they receive throughout the day. 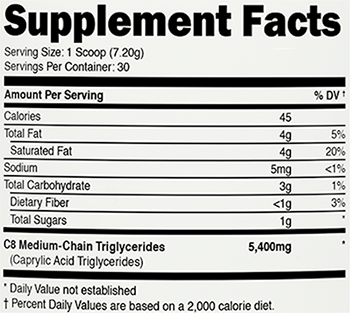 C8 Medium-Chain Triglycerides (Caprylic-Acid Triglycerides). MCT’s are found in foods such as butter and coconut oil, however, our MCT’s are made from 95% C8 MCT, which is the highest concentrated amount of C8 MCT on the market and that is why having a spoonful of coconut oil is nowhere near the same as taking a scoop of Complete MCT’s. The effects of C8 MCT can be felt within minutes whereas other forms of MCT may take hours. Stevia is a low-calorie sweetener that tastes great and does not affect blood sugar levels. How do I take Complete MCT’s? Our MCT Oil Powder has a creamy flavor and tastes great in many drinks. 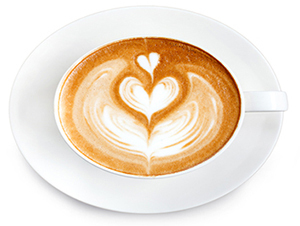 If you love coffee then you will love adding 1 scoop of our MCT’s as a delicious, energy-filled coffee creamer. MCT Oil Powder also tastes great in water, almond milk, coconut milk, smoothies & shakes, and when baking special treats. How can MCT's help me burn body fat? 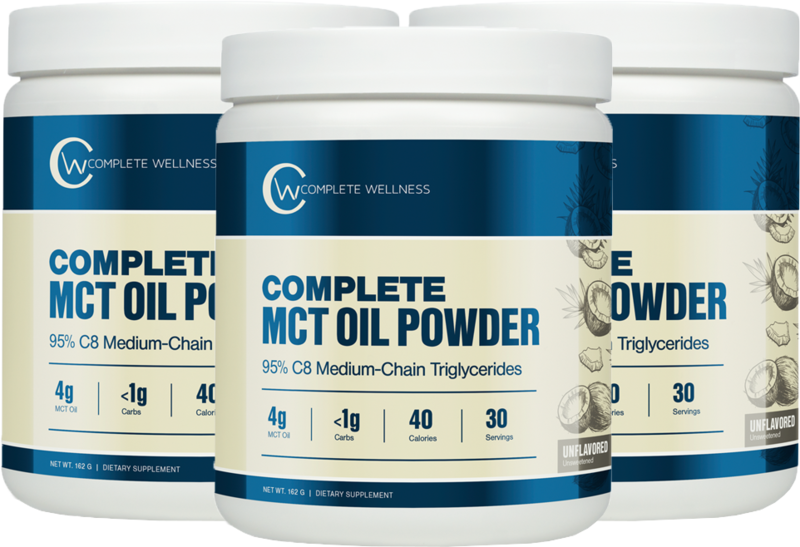 MCT’s improve satiety, making you feel fuller longer and allowing you to go longer periods without eating, along with boosting your metabolism & increasing your energy levels. This combination of effects help you to burn more calories with less. Will this fit into my diet? Yes, in fact saturated fatty acids play an important part in maintaining good overall health and should be consumed daily in everyone’s diet. When should I take Complete MCT's? 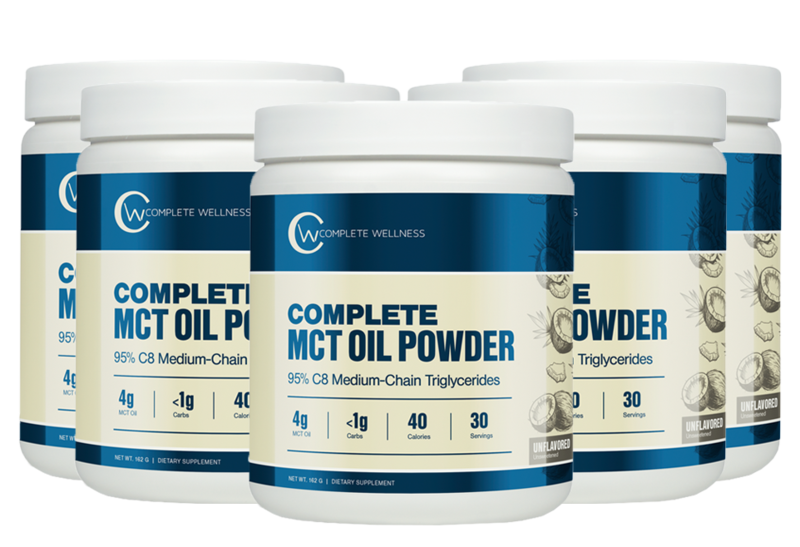 Your body will begin to convert C8 MCT’s into fuel almost immediately, therefore you can take MCT’s whenever you please. 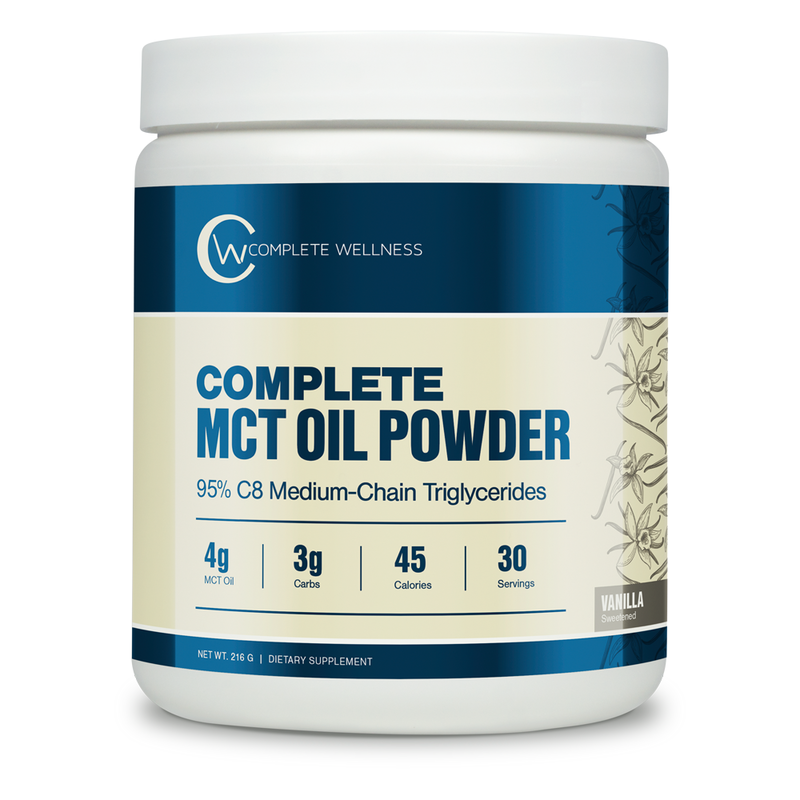 We recommend taking MCT's upon waking up, before work, midday to keep you focused, or before work outs. Ours is made with 95% C8 MCT, the highest concentrated amount of C8 MCT’s you can buy. Other competitors do not even come close. Oh, and the taste is incredible. What if I do not see any results? We’ve spent a lot of time formulating our ingredients to ensure that you get the most out of every scoop. We pride ourselves on quality rather than price and that’s why we stand behind our products so firmly. However, what we care about most is YOU and if you try any of our products and truly do not experience the results you were looking for then we will refund you 100% of your purchase with our no-risk 60-day “you love it or it’s free” money-back guarantee. 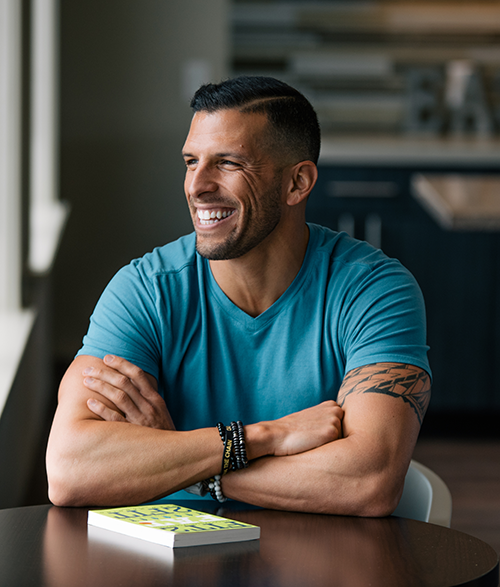 At Complete Wellness, it is our mission to help millions of people lose weight, reach optimal health, and ultimately help them transform into better versions of themselves. 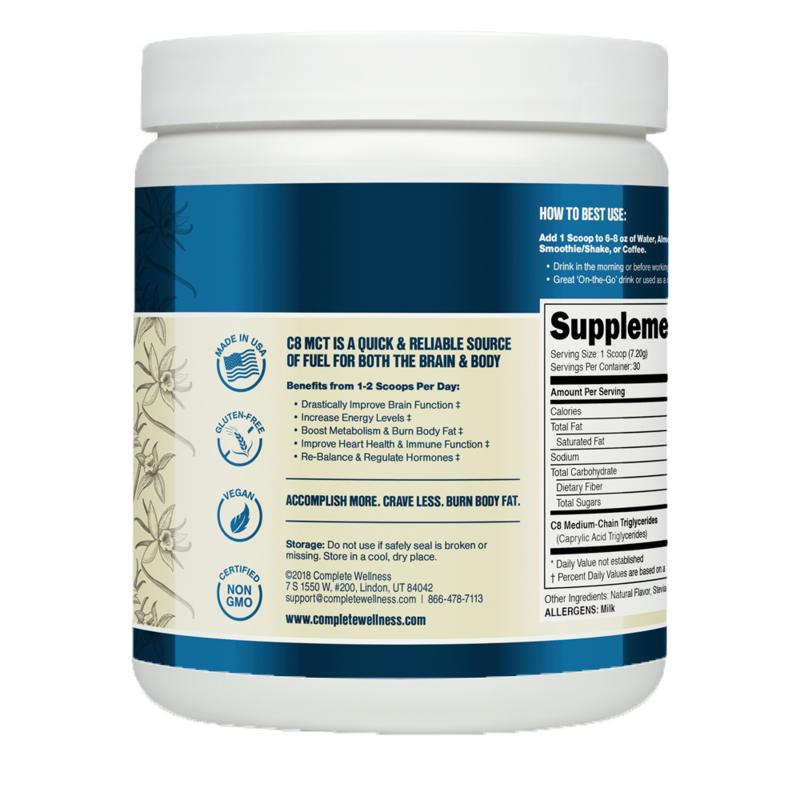 We pride ourselves on providing top quality, science backed education and supplements. We do NOT believe in wasting peoples time or money. What you receive is the end product of countless hours of testing and research for supplements we personally use and we are proud of that. We want to help you achieve your health & fitness goals in the fastest, easiest, and most delicious way possible. We believe that life is not about being perfect, it’s about being complete. Copyright © Complete Wellness. All rights reserved. *The information on this website has not been evaluated by the Food & Drug Administration or any other medical body. We do not aim to diagnose, treat, cure or prevent any illness or disease. Information is shared for educational purposes only. You must consult your doctor before acting on any content on this website, especially if you are pregnant, nursing, taking medication, or have a medical condition.